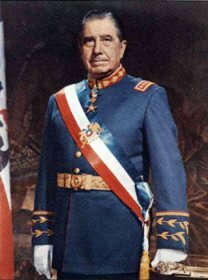 The Chilean general, president and dictator Augosto Pinochet Ugarte, who ruled his country from 1973 to 1990, hit front pages of newspapers worldwide for over four decades, in the 1970's, 1980's, 1990's and 2000's, and was during that time a controversial figure known by most everyone in The Western World. Numerous biographies in english of somehow comparable figures of The Tweentieth Century are commonly available, like of Tito (1892-1980), Che Guevara (1928-67), Fidel Castro (b. 1927), Saddam Hussein (1937-2006) and Ho Chi-Minh (1890-1969). Numerous biographies of these more og less randomly picked figures are also plentifully in print and circulation in far less widely-read languages than english. Hovever, no elaborate biographical work in english is available on Chiles Augusto Pinochet. His autobiography Camino recorrido was printed in english titled A Journey Through Life in just 1000 copies in the early 1990's. His former Secretary of Education, Gonzalo Vial Correa (1930-2009), published a biography, Pinochet. La Biografía in 2002. It has been published in Spanish only. In an attempt to fill the gap this biography primarily on Pinochet's professional life and work is launched. It will be published in stages as it is written. A biography on Augusto Pinochet with lots of source text. The biography is not finished yet but contains a lot of material. Well functioning site on Pinochet. There are source texts in the form of CIA documents, newspaper articles etc. and biography.